Methyl B-12 1000mcg 100 tab. 1 tablet once a day, dissolve in the mouth. 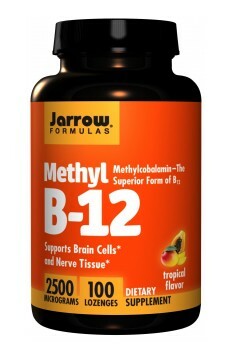 Each dose contains 1 mg (1000mcg) of vitamin B12. It is recommended to people exposed to increased risk of vitamin B12 deficiency, for those who suffer from intestinal and microflora disorders, overproduction of gastric juice and in case of deficiency of Castle's factor. Increased need for this vitamin is also seen in older people (especially over 65 years of age) and in patients who are on a vegetarian diet. 800 mg of Ashwagandha extract in each capsule. Standardized for the content of 1.5% withanolides. Natural cod liver oil rich with omega-3 acids and vitamins A and D. Powerful support for the heart, the brain. Rich in macro- and microelements, a source of chlorophyll, vitamins and minerals, removes toxins and heavy metals. Bioavailable Iron From Ferritin - the major iron storage protein, naturally isolated from bovine spleen.